Dong Quai, the “queen of herbs” in Chinese traditional medicine, has profound benefits for females, including circulatory benefits, menstruation benefits, intestinal benefits, and emotional benefits. Pronounced as “dong” and “quiet” without the t, dong quai has become one of the most popular herbs for females in Chinese herbology. 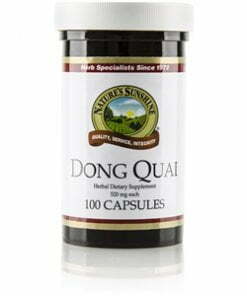 Each Nature’s Sunshine Dong Quai capsule is 520 mg.
Magnesium stearate (vegetable), Kosher gelatin, and water.